Requiring more than 200 pages, 12 hours of work per day for a solid month, and what must have been gallons of printer ink, is this jaw-dropping life-size papercraft Link that the artist Michaela M. completed this week. Yes, she has a template for those with the time and the patience to try to re-create her masterpiece. 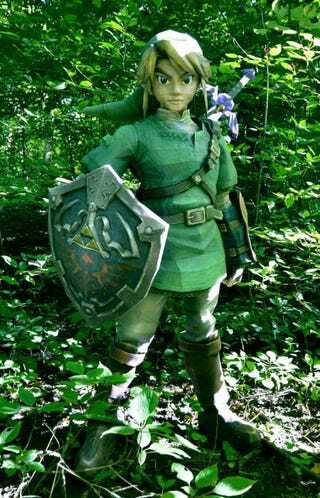 Link is made from 250 gsm paper, Michaela writes, which is about four times stronger than normal paper. Foam core supports can be found in his pants, boots, waist, shield and sword, but otherwise, he is 100 percent papercraft, capable of standing on his own. Link's sword can also be inserted into the scabbard. There's the one picture here to whet your appetite; for much more high-resolution goodness, see Michaela's deviantART page, and also her personal blog, which has many more outtakes.